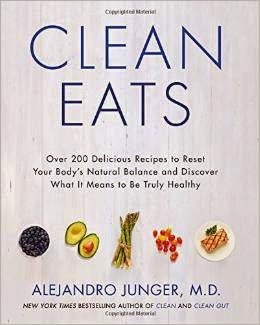 BOOK LOOK: CLEAN EATS BY ALEJANDRO JUNGER, M.D. With the abundance of healthy food bloggers for inspiration, I do not turn to cookbooks for ideas as much as I used to. 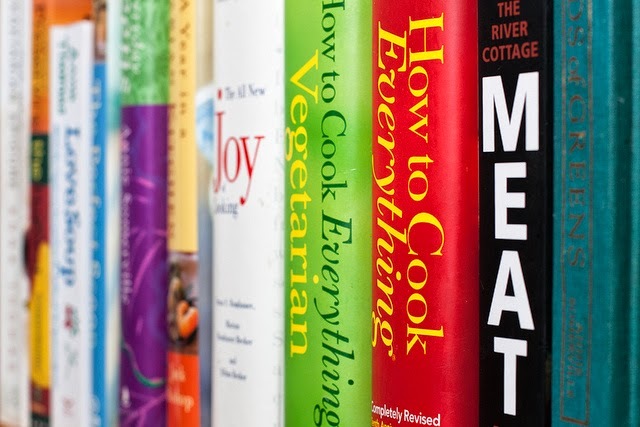 In fact, many of my beautiful cookbooks sit rather dusty on my shelf. But, I had heard so many good things about Clean Eats by Alejandro Junger, M.D., I ordered a copy this past summer, and it has not disappointed. Not in the least. And, I promise not to let it get dusty for long! If you are new to clean eating or healthier eating practices, the tone of the book is welcoming and not intimidating at all. Yes, it espouses clean eating and what that means so you won’t find processed foods, unhealthy fats, refined grains, etc. in the ingredient lists. However, it is done in such a positive, gentle and inspiring way, it motivates you to be better and do better for you and those you feed. The recipes are abundant (over 200) and there is something for everyone: vegetarians, vegans, and meat eaters, too. Plenty, if not most, recipes are gluten-free and dairy-free as well. The recipes are easy to follow and not complicated. The recipes I tried taste great and they were fun to make. If you are into specific meal plans, several are offered. It is organized well and written well. I especially enjoyed the wonderful “big picture” essays on clean eating and what that actually means by many leading in the field. There are many recipe contributions from names you may recognize as well. The author suffered digestive health issues himself when he moved to the United States from Uruguay to do his post-medical school graduate work. His successful approach to healing himself ignited his “Clean Program.” He has many loyal followers and has helped many improve their health. Dr. Junger has also written two other books: Clean and Clean Gut. To learn more about the author, Dr. Junger, and his programs as well as his approach to clean eating and philosophy, go here for a biography of him. To purchase the book, many popular bookstores sell it as well as Amazon here. Or, check your public library for a copy as well. 2. Expand your reach. Clean Eats walked me through how to use coconut flour, something I had never used before and now I reach for often. It is higher in protein and fiber and lowers in carbohydrates. It is also gluten-free. 3. Throw in some beans. I cook with beans and lentils but now, I include them more often in my cooking. They are inexpensive and you don’t have to make them center stage of your dish. Even adding a handful can increase the fiber and B vitamins as well as acting as a great digestive aid to your dishes. 4. Sprinkle more spice. I learned more about the medicinal properties of herbs and spices. (Some of my favorites are here and why.) I enrich my dishes with them often but I now know more about some new ones and what they can do. 5. Practice chemistry in the kitchen. It introduced me to homemade elixirs and herbal infusions. I hope to play around with this more this coming fall and winter using warm teas as a base, etc. Perhaps I will write a post on that later. And next time, more about those Clean Eats recipes . . .
Do tell! Do you have a favorite healthy cookbook that you turn to often or healthy food blog? Please give a link and tell us about it. Have you read Clean Eats or any other books by Dr. Junger? What did you think? Here’s another great healthy food book for inspiration and ideas. Flip through these easy tips to eat right. Here are my food rules that I try to live by. The recipes really taste great and they are not complicated, Laura! It is also not a "diet" of any kind. And, the essays — you will really enjoy those, too! What a wonderful book suggestion! I'm always moving in that clean eating direction, but get frustrated with myself for not being aware of more recipes I should be trying. I think just having the knowledge of what I should be trying will help me get off the beaten path and try more clean eating recipes. It's the ideas I need so that I just just resort to fall-back recipes. Great book! You really should! And, let me know what you think! I always like hearing more about healthy eating books. I will keep an eye out for this one. I really am enjoying the book, Ceara. It is full of other wonderful perspectives, too, that I think will get you thinking and that you will find inspiring.